On Good Friday (April 22, 2011), U.S. District Judge James Mahan issued a ruling that could shrink the biggest copyright troll in the U.S. down to size. “[Righthaven’s] litigation strategy has a chilling effect on potential fair uses of Righthaven-owned articles, diminishes public access to the facts contained therein, and does nothing to advance the Copyright Act’s purpose of promoting artistic creation,” U.S. District Judge James Mahan ruled Friday. Widely considered the biggest copyright troll in the U.S., Righthaven is a copyright holding company set up in early 2010 specifically to sue bloggers, webmasters, and social media users to failed to get permission before reposting or sharing content from newspapers and publishing companies who signed agreements with Righthaven, including the Denver Post and The Las Vegas Review-Journal. The ruling comes on the heels of a ruling the week before by U.S. District Judge Roger Hunt in another case that unsealed documents that the Electronic Frontier Foundation (EFF) says proves that the plaintiff, Righthaven LLC, has falsely claimed to own copyrights which it does not in fact own. One defendant, David Burnett of the Armed Citizen blog said that Righthaven engages in “legal extortion.” “They print their stories online with all kinds of buttons inviting you to share the story on the web. If you repost the story with a link, they sue and you have to pay them money to make it go away,” Burnett said in a press release announcing the blog’s resurrection after a five-month closure. According to a website set up to collect information about suits filed by Righthaven, the firm filed more than 267 lawsuits in 2010, often asking for as much as $150,000 in damages. Court records show that the firm often settles for payments of $1,500-$3,500 if the website or blogger settles out of court. Approximately 80 open copyright infringement cases filed by Righthaven are still pending in Nevada District Court along, with other cases in jurisdictions across the U.S. Those cases can proceed — although Judge Hunt’s unsealing of documents may make it harder for Righthaven to score easy victories. David Kravets published a great piece in Wired on April 19, 2011 which explains the ins and outs of the EFF’s case against Righthaven. 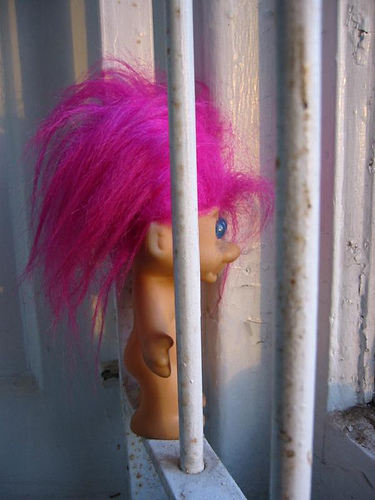 Perhaps the rulings by Judges Mahan and Hunt will shrink the biggest copyright troll in the Western U.S. down to size! Gallery | This entry was posted in Uncategorized and tagged blogging law, copyright infringement, copyright troll, Deb McAlister, EFF, Electronic Frontier Foundation, Righthaven. Bookmark the permalink.